Approximate number of interments: 10,000, including 5,187 First Californians, 150 Mexicans, and various parishioners. Original burials had wooden markers. When they decayed, the graves were reused. About 200 tombstones remain, most of them post-Gold Rush. Open: Daily, except Thanksgiving, Christmas, and New Year’s Day. November 1 to April 30 9-4; May 1 to October 31 9-4:30. The Misión San Francisco De Asis was the sixth of the mission parishes founded by Spain in its attempt to colonize California. On June 29, 1776, five days before the Declaration of Independence was autographed a continent away, Father Francisco Palou performed the first mass at a makeshift altar, consecrating the land to the saint who founded the Franciscan Order of poor monks. When the city eventually became known as San Francisco, the Mission came to be called Mission Dolores, because it had been established near a small stream named for Our Lady of Sorrows. Mission Dolores is the oldest intact building in San Francisco. Buried beneath its floor are several of San Francisco’s founding fathers, including Lt. Jose Joaquin Moraga, leader of the June 1776 expedition, and William Leisdesdorff, a pioneer who became America’s first African-America millionaire. The mission fathers’ goal was to convert the native Miwok and Ohlone peoples. 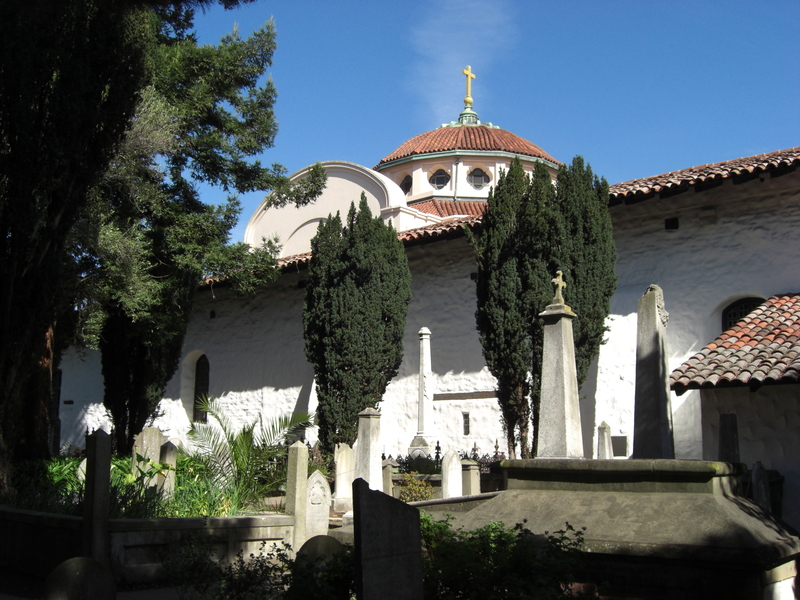 According to the San Francisco Chronicle, “Mission Dolores had one of the highest death rates of Spain’s 21 missions in California. Thousands of Indians of bay tribes are buried in the vicinity. Nearly all of them died of European diseases, or overwork, or of the destruction of their culture.” Bret Harte’s California reports that the first interment in the mission graveyard took place as early as 1776. Many of these First Californians were buried under wooden markers, which have not survived the years. They are commemorated by a diminutive statue of Kateri Tekawitha, Our Lady of the Mohawks, which is dedicated “In prayerful memory of our faithful Indians.” Kateri is the first Native American who was beatified, the first step toward becoming a saint. History lies all around in this pretty little graveyard. Buried here are Don Luis Antonio Arguello, first governor of Alta California under the Mexican government before the U.S. took control of the area in 1846; Don Francisco de Haro, the first Alcalde (mayor) of San Francisco; three victims of the Vigilance Committee: Charles Cora, James P. Casey, and James “Yankee” Sullivan; as well as the namesakes of the neighboring streets: Noe, Sanchez, Guerrero, and Bernal. Roses, ranging from blush pink to frothy yellow, cluster around the statue of Father Junipero Serra sculpted. Father Serra founded nine of the California missions, but not this one. He is buried at the mission in Carmel. Father Palou, who preached here, is remembered with a plaque of the Mission’s wall: “Zealous missionary; able administrator; successful pioneer; chosen companion of Junípero Serra. First historian of California.” He is buried in Mexico City. The cemetery has seen several major changes over the years. A photograph in the Mission’s museum shows the cemetery stuffed with graves, most of which are gone now. The city closed the cemetery to new burials in the 1890s; many families moved their loved ones to other Catholic cemeteries in the area. At one point, the cemetery had a large duplicate of the Grotto of Lourdes. It features in Hitchcock’s Vertigo, when Kim Novak visits the (fictional) grave of Carlotta Valdez. You can glimpse it in the 1958 movie trailer. Stephen Marcus Landscape Company oversaw the last overhaul of the Mission graveyard in 1994. They summed up their aim in rehabilitating the cemetery-garden: ”to retain its eloquence of the past while adding new plantings that would provide beauty and seasonal interest, be drought tolerant and low maintenance, and incorporate as many native species (especially those used by the Indians) as possible.” Currently, a large tule reed house shows how the local natives lived. A self-guided tour of the old Mission, the post-1906 Basilica, the little museum, and the cemetery is available from the gift shop. Admission is $5 for adults, $3 for children. Docent tours are available by reservation for groups of ten or more. A deposit is required. Contact the curator at (415) 621-8203. This entry was posted in Cemetery of the Week and tagged Bay Area cemeteries, California cemeteries, cemetery tours, churchyard, Mission Dolores, pioneer cemeteries, San Francisco cemetery. Bookmark the permalink.